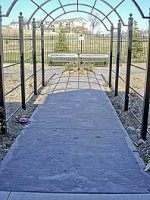 Native animal prints have been pressed into the walkways at the Bellevue Public School’s Nature Explore Classroom, hinting to children that this magical place may hold special adventures for them. 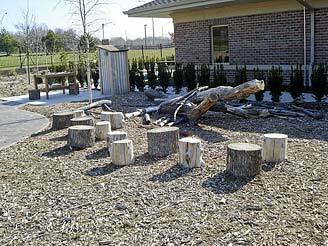 The outdoor classroom design allows students and parents to participate in a variety of activities and hands-on nature opportunities. A variety of climbing flora has been planted along the sides of their grand, metal arbor leading into the classroom, guiding children into this special place. This classroom boasts a beautiful garden with lots of trees, plants and flowers. The surroundings allow the children to discover, explore, dig, observe, and catch bugs. Two nature art tables allow hands-on learning with a variety of natural items including feathers, seashells, skeletons and seeds. This durable classroom is equipped with a sprinkler system that helps low maintenance plants, flowers and bushes evolve each year. In the midst of the pathway, sits a large sundial, adding artistic flair into the classroom. Benches positioned around the classroom, allow adults seating while observing children in learning and play. Bellevue Public Schools has personalized their design with a sandbox, tricycles and wagons, bug catchers and nets, magnifying glasses and tweezers, and many other innovative props for each of their areas. While constantly continuing to promote learning, many unique items have been added to the site. Nature journals and many homemade items such as binoculars are incorporated into everyday use. A rain gage, thermometer, spray bottles, butterfly nets and scarves are used to enhance each child’s daily nature experience. 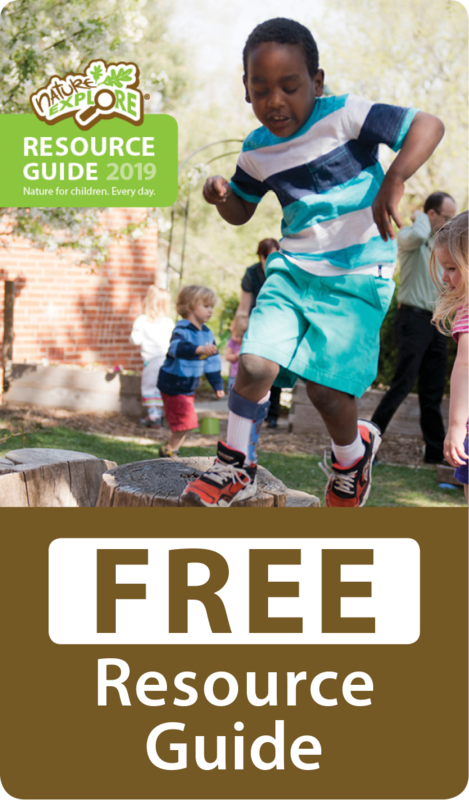 With the help of family, volunteers and generous donors, Bellevue Public Schools has made a true commitment to connect children with nature on a daily basis and is making a positive impact in the school system and community.